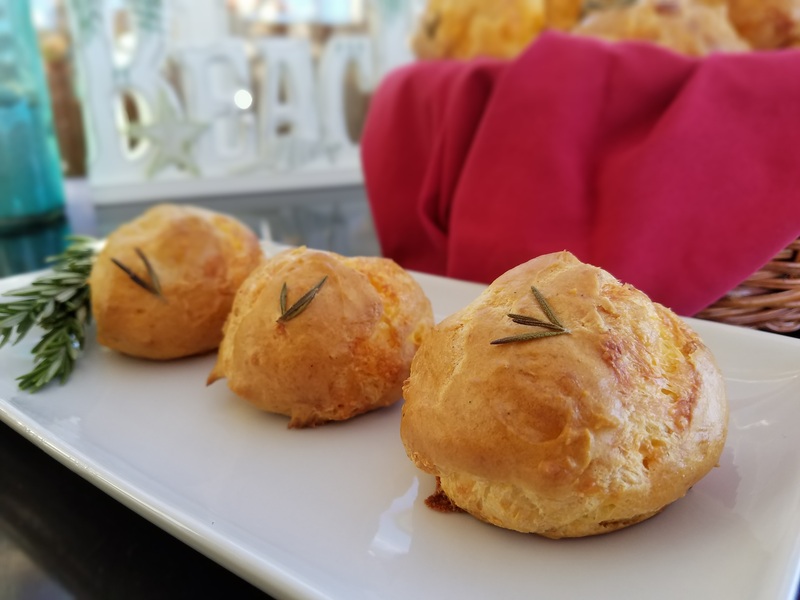 I made these cheddar cheese puffs for the July 4th backyard BBQ and also made a big puff for Nike’s flat iron steak birthday sandwich. All the human said these puffs are so yummy on its own, and Nike voted 4 paws up as he wolfed down his b-day cake in no time. 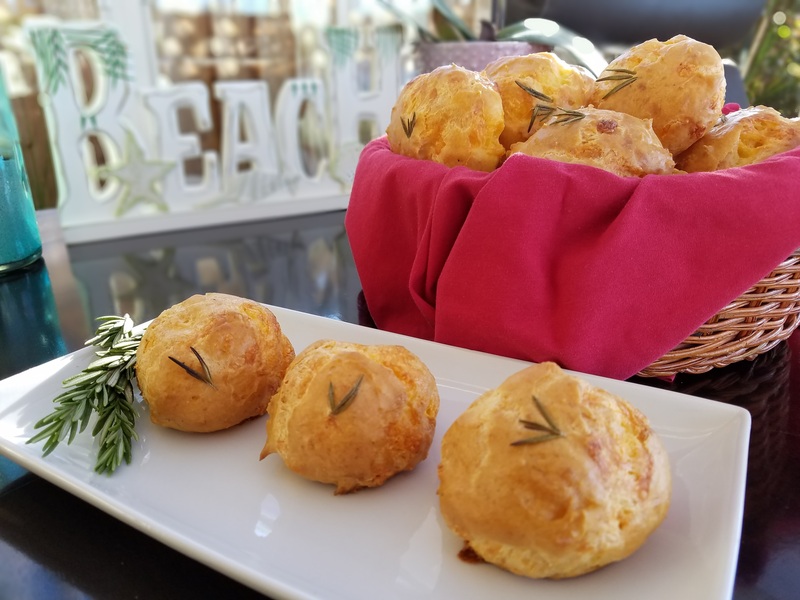 Next time, I will try these savory puffs with some crab salad filling, for the humans only. In a medium saucepan, bring the water, butter, salt, and ground black pepper to a boil. Add the flour all at once and stir until a dough ball forms and pulls away from the side of the pan. Transfer the dough ball to the bowl of a standing mixer and let it cool for 5 minutes. Add the eggs, one at a time and beat with the paddle attachment at low speed until well combined. Add the swiss and cheddar cheese and mix well. Bake immediately or chill in the refrigerator until ready to use. Use a cookie dough scoop, shape small dough balls onto a ungreased cookie sheet, spacing them 1.5″ apart. Garnish with rosemary leaves on top of each scoop of dough. Bake at 400 degrees speed convection for 10 minutes. Reduce heat to 375 degrees and bake for another 10 minutes until the puffs are fully risen and golden brown. Remove from the oven, cool and remove puffs from the cookie sheet with a spatula. Serve as is or add any filling of your choice. Note: I have tried to line the cookie sheet with parchment paper, but the puffs do not rise as well and collapsed after taking out of the oven. So I suggest not to use parchment paper. These look delicious. Where is the picture of Nike?? ?